The C.S. Lewis Institute provides a fine biographical sketch of Eric Liddell, Scot, Christian missionary, and Olympic Gold Medalist. It gives context to Chariots of Fire and portrays a remarkable man. .... 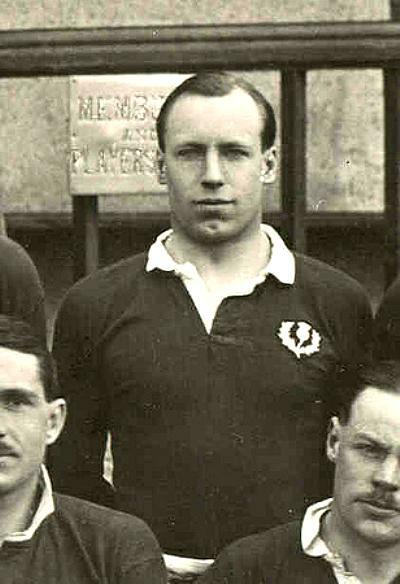 In the fall of 1921, Eric and his brother Robert played rugby for Edinburgh University. While only five-foot-nine and 155 pounds, Eric’s speed and determination made him an instant rugby star at the wing position. He was selected to play on the Scottish national team in 1922. He and his former schoolboy partner, Leslie Gracie, made a powerful “Gracie-Liddell Wing” combination. Over the course of his short rugby career, Eric played for Scotland in seven games and was on the winning side six times. The greatest win was against Wales, which Scotland hadn’t beaten since 1870. That win helped make Eric Liddell a hero among the working class of Scotland who admired the toughness and skill required to be a world-class rugby player. Eric’s status as a Scottish national team rugby player and Scottish sprint champion gave him the platform that he would soon use to further the gospel of Jesus Christ. In the spring of 1923, one of Robert’s friends, D.P. Thomsen, was struggling to find a way to reach the working class men and miners of Scotland. Noticing the men’s passion for rugby, he thought to ask Eric if he would be willing to come to a meeting hall in Armadale and speak of his faith, though he knew that introverted Eric rarely talked openly about his Christian faith. D.P. traveled to Edinburgh and went straight to the Liddells’ home. He was greeted by Robert; when asked if Eric would speak at an evangelistic meeting, Robert said, “I think you’d better ask him yourself.” A few minutes later, when Eric came in from a run, D.P. shared his vision. Would Eric address the men? Eric dropped his head for a time, reflected upon the question, and then replied, “All right—I’ll do it.” That response was to change the course of Eric’s life. In fact, the next morning, before he could second-guess himself, he received a letter from his sister sent from China weeks before; it ended with Isaiah 41:10, “Fear thou not; for I am with thee: be not dismayed; for I am thy God: I will strengthen thee; yea, I will help thee; yea, I will uphold thee with the right hand of my righteousness.” This confirmed his decision to use the platform of sports fame to share his faith openly. He would never look back and would proclaim his love for Jesus with enthusiasm and boldness in the days to come. My whole life had been one of keeping out of public duties but the leading of Christ seemed now to be in the opposite direction and I shrank from going forward. At this time I finally decided to put it all on Christ—after all if He called me to do it, then He would have to supply the necessary power. In going forward the power was given me. Since then the consciousness of being an active member of the Kingdom of heaven has been very real.